The Blue Man Group in NYC is one of the most popular off-Broadway shows since 1991 and has already been watched by over 35 million spectators worldwide. The entertainment show is truly the only one of its kind in New York and fun experience for sure. What is the Blue Man Group in New York? The Blue Man Group is a performance art company whose show has already been watched by millions of people all over the world. Even though you can see the Blue Man Group in multiple cities, you should know that New York is where the Blue Man Group started more than 30 years ago, meaning you can see the Blue Man Group where it all began! 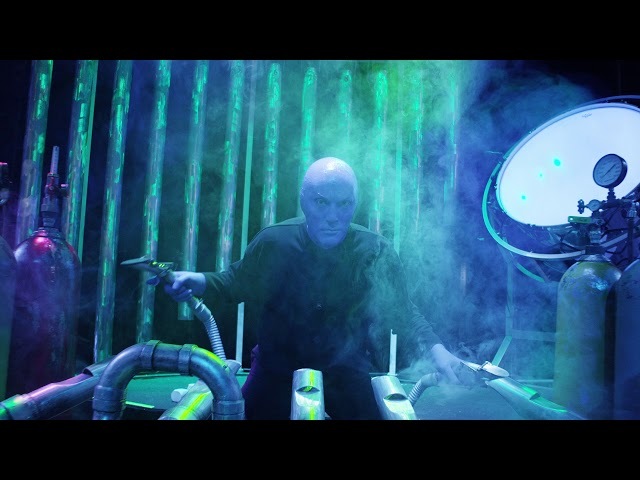 The Blue Man Group features several blue, bald men that captivate the audience with their multi-sensational experience. Their performance combines music, colors, acrobatics, and even some comedy! The Blue Man Group has found a way to communicate without speaking a single word. Instead, they have found a different, universal language to talk to their audience. The Astor Theatre in New York is a small theater with a capacity of about 1,000. There are really no bad seats. To maximize your Blue Man Group experience and have the most fun though, we’d recommend picking seats in the front Orchestra section. You’ll appreciate the interactive show even more! The Blue Man Group Show lasts about 2 hours, but we must say time seemed to fly by super quickly! The show is extremely captivating and there’s always something new to look at. Besides the music played by unique instruments and creative light effects, you can expect many more surprises during the show. We would also say that it was way more interactive than we had anticipated! Bottom line: You won’t be bored! What age is the Blue Man Group appropriate for? The Blue Man Group is not recommended for children under the age of 3. Even if your children are over 3, you should keep in mind that they will be able to sit through loud music and light effects. Is the Blue Man Group still performing in New York? How long is the Blue Man Group? The Blue Man Group Show off-Broadway production lasts for 1,5 hours. Where is the Blue Man Group performing? The Blue Man Group is performing in NYC, Las Vegas, Chicago, Boston, Orlando and Berlin, Germany. There is also a Blue Man Group World Tour, traveling through all continents. How do you get to the Astor Theatre in New York? The Astor Theatre in New York is located at 434 Lafayette St in NoHo: To get to there, take subway lines 4 6 to Astor Pl and you’ll only be a minute away from the theater.